There are 68 posts in this topic. You are on page 1 of 2. I'm wondering if I trade my big buck hunter pro for a Star Trek pro if that seems like a fair trade? Any thoughts? value-wise ST pro is higher. Ya I know the fun factor depends on the person I don't think the values are miles apart tho maybe a couple hundred bucks? Given equal condition, I'd say ST Pro is probably worth $200 more. BBH has remained a strong seller. Well...like making any deal it only takes finding one person that agrees with the terms of the deal...good luck! If by fair trade you mean you are getting the more fun, more valuable, better themed game then yes. Depends on condition. If both are nice the ST is probably worth a couple hundred more at most. People saying 1k have lost their minds. BBH didn't come in a pro. one version only. ST is worth more technically. St pro $6k cdn and up. well, I guess technically. yes.....pro and only. As stripped down as it looks, it was a pro, before there were pros. It's the name of the game. Nothing to do with the 3 tier system Stern uses. Big buck hunter pro was the name of the arcade machine too. straight swap-st is a boat anchor, BBH is waaaaaaaaay more fun. Maybe offer $250 for a feel good. No flow on BBH? what game you playing Dude. Super fast, fun and funny. Unique with the moving buck too! "You got yourself a critter"
I'm thinking no, but for someone who likes the BBHP theme alot it might be a pretty decent swap. I'm sure there are alot less BBHPs out there than ST Pros. BBH +$500. BBH is a better game than ST by a long shot and waaay harder to find. Not even close BBH is a turd. ST has the full package of game play, theme, and sound and lights are incorperated perfectly with shaker use. End of story. Isn't the deer toy on the #bigbuckhunter prone to breakage and hard to get? I seem to recall an issue about getting parts for BBH. nah, pretty simple and reliable mech. I think if the theme were different BBH would have been a hit. The gun game fans didn't translate to the pin. It's a fun game, the little I played of it and the wizard mode is all but impossible to achieve. what do STpros sell for? BBH sell for 4-4500 regularly. I'm not an outdoors man. But you could create a comical redneck themed gameroom from BBH, Fish Tales, Frontier, maybe NASCAR, Indy "turbo Bobby" 500, or Nitro Ground Shaker. 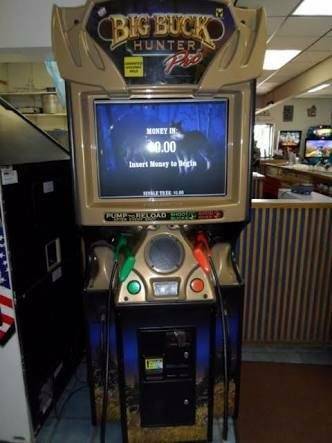 You'd have to be drunk on moonshine to pay $4500 for a big buck hunter. It's a terrible game. Unless you're talking about the video game. That's fun. BBH is actually a really fun game and AbacusMan was right all along! As others have said, it all comes down to what you think the value is at. To me, if the other person was willing to trade straight up and you were good with it, it's a fair deal on both sides. ST is worth more in the open market, but BBH is rare enough that sometimes you can get a really solid price for one because people can't find them. I own a BBH, and I bought it and had it delivered to to a show. A friend at the show told me he had a buyer for it at $5k+ if I wanted to sell because they are impossible to find. I still held mine. It's probably the best offer I'll get on mine, but I also really like the game (it's very similar to Iron Man), and unlike Iron Man, there is no way they'll remake it. I'm not a fan of either, but prefer BBH. Star Trek Pro is worth more cash, but it's a complete snooze fest for me. are ST pro really selling for 5-5500 now? Really? The one at our bar league location was an unreliable mess until the wire conduit design was completely changed. The stock design, we wires would catch when at on the conduit and break making the buck not register. Elk also regularly needs tightening back up. It gets sloppy and then doesn't register. It can also wear to bare wood if it get's really sloppy. Autolaunch is often an issue in elk because it can't make it all the way around. About 1/2 the games I have played the buck channel is also not flush on both sides. Mech eng wise the game is a mess. Software, the game is a mess. Theme is awful. But it is one of my favourite games. I have owned both.....BBH is still here. I, personally have enough like this to be happy. BBH, is quirky, and fun and different than ST. I personally found I enjoyed Elvis, more than ST, at a $2000 savings. Is the trade worth it? Sure if its your taste, and you have lots of $$$ info. Simply too many good choices! Here in western Canada everything is selling and above values ($5k tftc for example) More pinball on location is bringing new young people with extra income into the hobby. However, if a bbh was listed on kijiji for 6k it would sit there for a while. If st pro is listed for 6k it probably sells the same day listed and wouldn't make it a week. And bbh sells/trades quite often here in the west. Maybe they shipped more out here? They seemed to be in every other sports pub a few years back. Jump on that at once. One game is excellent - one is barely OK, and certainly flawed code-wise. Trek has one of the most complete codes in all of Stern pinball IMHO. My top DMD regret sell - only did so to get Metallica when I could not afford both. Not at all. Most people got them Nib for $4600-$4800 and are lucky to get $4500 huo at resale. I can only assume people are thinking bbh goes for $3500 or something. If both machines have similar history i.e. HUO, and in the same condition then I would say its close to an equal trade. I sold my HUO Star Trek Pro for $4400 and couple months back.....maybe the ST is worth a couple hundred more?